This rack holds up to 25 thermometers in a vertical position. Hole diameters in top and middle plates are 5/16″ (7.9 mm) while the bottom plate has only 1/8″ (3.2mm) diameter drain holes. 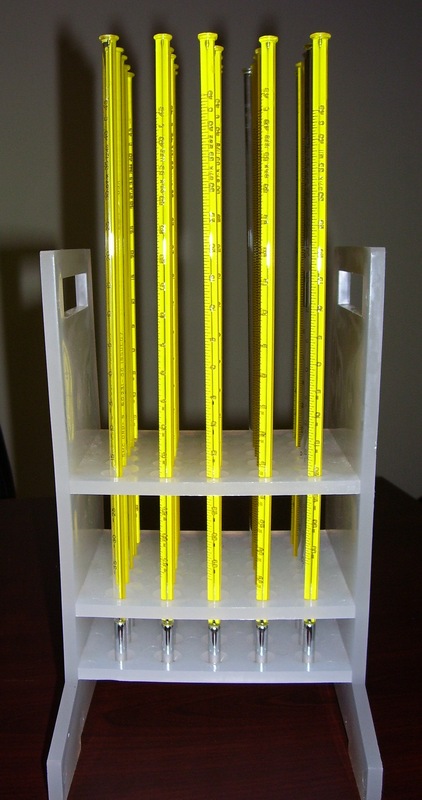 Distance between top and bottom plates is 4 1/8″ (105 mm). Overall dimensions are 5 1/8″x 8 3/8″x 9 7/8″ high (149x213x251). May be steam autoclaved at 250 °F (121 °C). 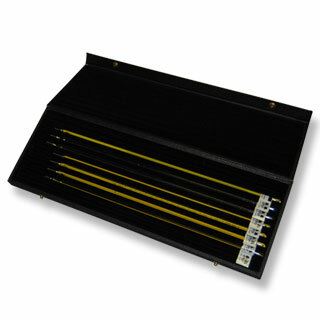 Wood reinforced, leatherette covered cases with velvet lined interior. 2 safety snaps on cover. A ‘must’ for certified thermometers to protect your valuable instrument when not in use. Available to fit most thermometers in this catalog as well as those of other manufacturers, ICL Armors are fabricated from seamless brass tubing, nickel plated for corrosion resistance. Each armor is fitted with suspension ring.